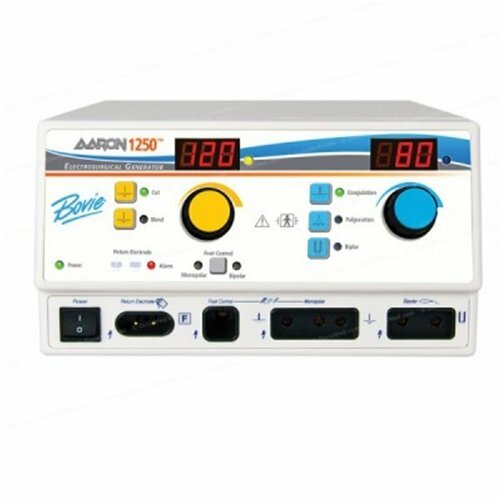 Complete with Cut, Blend, Coagulation, Fulguration, and Bipolar modes, the multi-purpose Bovie Aaron 1250 electrosurgical generator is ready for any surgery environment. Incorporated in the unit are automatic safety features like self-test circuits, audible tones, discreet outputs, isolated circuitry, and Bovie NEM™ (neutral electrode monitoring) so there are never any unexpected errors while in use. With 120 watts of cutting power and 90 watts of blended (80 watts max power) and fulguration (40 watts max power), this generator is one of the toughest on the market. The power output is calibrated in watts with high visibility, illuminated digital displays. The Aaron 1250 remembers its last selected Cut and Coag settings. When the unit is powered up, it performs a safety check and automatically returns to those settings. The Aaron 1250 offers pinpoint and fulguration coagulation. Pinpoint coagulation enables precise control of bleeding in localized areas. Fulguration (spray) coagulation provides increased control of bleeding in highly vascular tissues over larger surface areas. 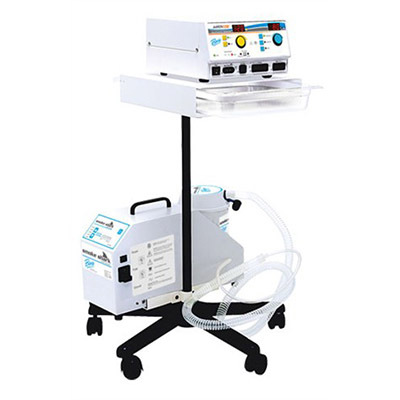 Electrosurgical safety is the result of well thought out equipment design combined with safe surgical practices. This medical device represents contemporary design using the latest in state of the art digital technology. BovieNEM™ and BovieGuard™ means safety is engineered inside. The FCFS™ (first come, first served) discrete output design of the Aaron 1250 enhances safety by allowing only a single output to be activated at any given time. This feature ensures the device you initially choose to activate will be the active device. Secondary commands will not override the first command. For instance, while the monopolar foot controlled output is activated, all hand-switching is inactive, as well as the bipolar footswitch capability. For added safety, this unit has independent bipolar controls, discrete output, and dispersive electrode fault alarms in the sensing as well as non-sensing modes, and is designed with an isolated RF output. Digital error detection equates to unsurpassed safety for the surgeon, O.R. staff, and patient. The Aaron 1250 monitors all functions in real time to ensure proper performance. At the sign of any problem, the machine instantly disables the output and communicates the appropriate error code on the display.